Dhaka Stock Exchange Job Circular 2019. Recently Dhaka Stock Exchange Limited publish Management Trainee Program Officer post Job Circular 2019. As a result, Bangladesh daily job publish website publish this job circular by this page. So if you want to apply this job can be here. Dhaka Stock Exchange Limited, the premier bourse of this country, is committed to the country,s economic growth through the creation of wealth and access to the capital market. 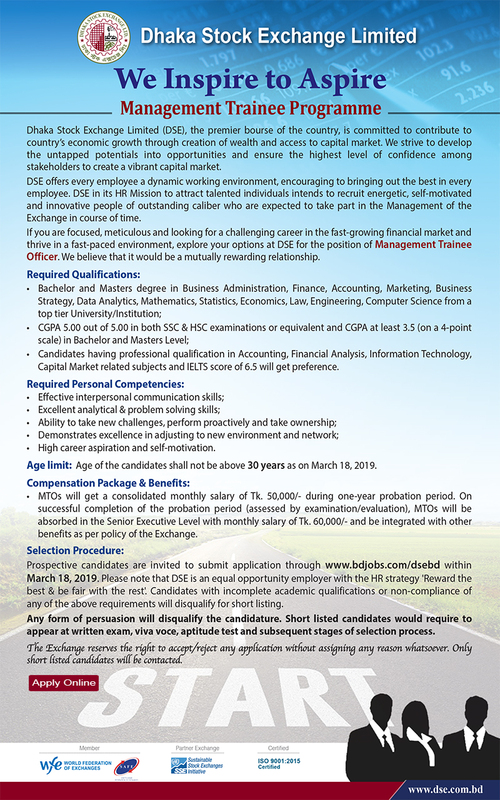 If you are focused meticulous and looking for a challenging career in the fast-growing financial market and thrive in a fast paced environment explore your options at dse for the position of Management Trainee Program Officer. We believe that it would be a mutually rewarding relationship. Recently Bangladesh job publishes website bd job publish this job circular their website. We collect this circular and publish our page. So if you want to apply can be through by this page. Bangladesh citizen male and female both can be apply to this job. So if you join this job can be here. We given all information of Dhaka Stock Exchange Job Circular 2019. Bachelor and Masters degree in Business Administration, Finance Accounting, Marketing, Business Strategy, Data Analytics, Mathematics, Statistics, Economics, Law, Engineering, Computer, Science top tier University/Institution. CGPA5.00 Out of 5.00 in both SSC and HSC Examination or Equivalent and CGPA at least 3.5( out a 4 Scale) in Bachelor and Masters level. Candidates having professional Qualification in Accounting Financial analysis, Information Teacher Capital Market Related subjects and IELTS Score of 6.5 will get preference. High career aspiration and self-motivation. Actually, this job circular published under bd job so if have a bd jobs accounts you can easily apply this job. If can,t bd jobs account you will be applied fully. We given by this page apply link. Firs go to apply link and click this apply now button. After the click, you get a application form. Now input your information and submit this. The author of Dhaka Stock Exchange (DSE) Publish Management Trainee Program Officer Job Circular. Now we have given this job apply, exam date, admit download and more. After completing this exam we given Dhaka Stock Exchange Management Trainee Program Officer job exam result by this page. When this official website publish this job same time we have given this exam result by this page.